Fall may have just begun, but we’re already looking forward to spring 2013 for Eagles baseball! Tryouts for all our teams between the ages of 8 and 14 will be held at PBI’s indoor training facility in Upper Saddle River during the month of November. Please note that league age for spring 2013 play is the player’s age as of April 30, 2013. For details on the tryouts, 2013 league and tournament play, the Eagles Winter Training Program, plus pricing and fundraising opportunities, click on the appropriate age level. Any questions? Please feel free to call us TOLL-FREE at 800-282-4638. 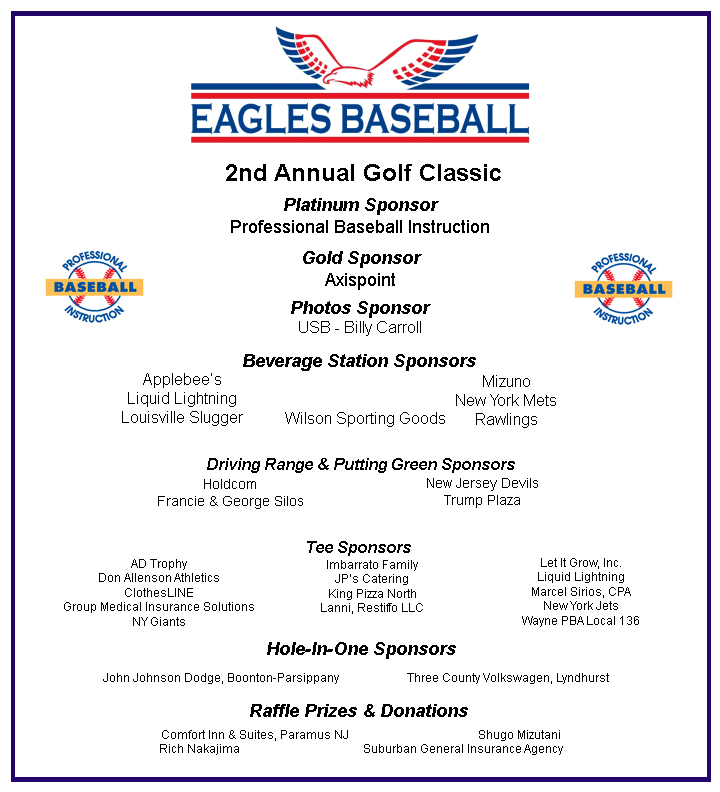 Mark September 14 on your calendar – it’s the date for the 3rd annual Eagles Baseball Association Golf Classic. We’re teaming up with the Knights of Columbus Sacred Heart Council 2842 and hope you’ll join us at beautiful Hickory Hills Golf Course in Warwick NY. Click here for details. Professional Baseball Instruction is holding tryouts for the EBA Eagles fall travel teams. 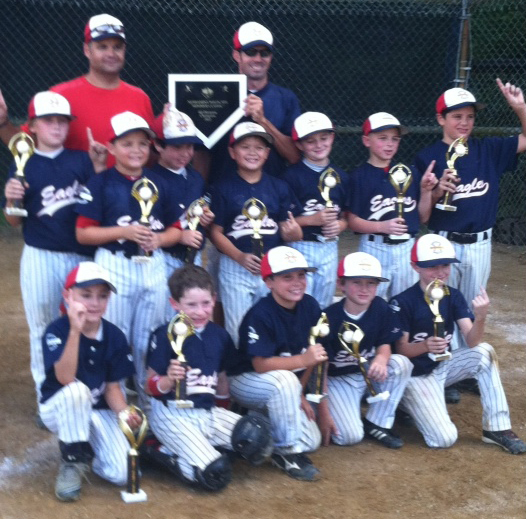 Teams will compete in the PBI Baseball league 2012 fall season as well as tournament play. There are teams for players between the ages of 8 and 14. Click here for details. 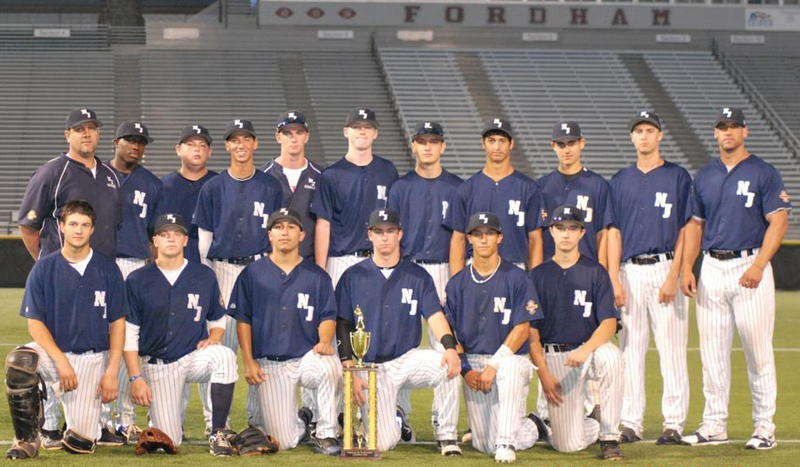 The 17U Select Showcase Eagles team finished up their summer 2012 season in late July with their 2nd consecutive Fordham University Tournament championship. Meanwhile, the 8U Eagles ended a great summer season by winning the 8U Championship at the Neshaminy PA Wildcats Summer Classic on July 29th in Neshaminy Pennsylvania. After rain cancelled all the teams Saturday pool play games the Eagles were forced to play 4 games on Sunday and the team came out ready to play!! The team went 4 and 0 in pool play and play off games scoring 43 runs and only giving up 4 runs with the pitching staff recording 3 shut outs during the day while pitching from 46 feet in this 8u tournament. The Eagle offense was in full gear averaging just under 11 runs per game, and the defense flashed some leather during the day as well. Again a total team effort by all 12 players on the team. More photos from the various tournaments our Eagles teams participate in can be found on the PBI Facebook page. There are tryouts for the Eagles teams at all age levels for the fall. Details are available by clicking here. The 2nd Annual Eagles Baseball Association Golf Classic was held Thursday September 15, 2011 at the River Vale Country Club in River Vale. 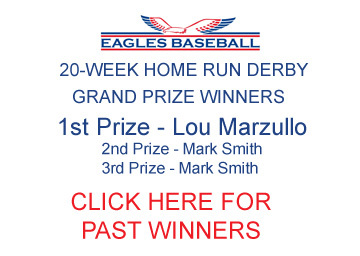 It was a fun day of golf, contests, and food all to benefit the Eagles Baseball Association dedicated to supporting youth baseball in the New Jersey-New York area.